The game of craps is actually quite easy to learn, especially if you are just playing the pass line. However, because there are many different bets and ways to play, some people are intimidated. Don't be! Casino dealers are always happy to assist you with questions about how to play and make bets. Craps is played on a long table with high sides. Find a spot on the table, ask the dealer for change and drop your bills where there are no numbers. If there is already a shooter and a point is established, meaning a "hand" is in action, there will be a round plastic button in one of the number boxes. The button is about the size of a hockey puck. If there is no point established, the puck will be in the middle of the table above the horn bets area. There is one puck for each dealer's side of the table. If the puck is on a number, wait until the shooter makes the number or sevens out and the dice go to the next player - perhaps you! When this happens, check the limit sign for the minimum bet, and place that amount on the pass line, choose two dice and throw them underhand and sideways down the table so they tumble and hit the back wall (of the table, not the casino). That's enough to start! You don't have to shoot to play, and you make the same bets, even when you are not shooting. All pass-line and don't-pass bets pay even money when they win. On the very first roll (the come-out roll) the pass line wins on 7 or 11 and loses on 2, 3 or 12. Any other dice total: 4, 5, 6, 8, 9 or 10, becomes the shooter's "point," and all players need the "point" to repeat again to win on the pass line - before the shooter rolls a 7. The shooter continues to roll the dice until they make the "point" or a 7. Rolling the point wins, rolling a 7 loses and the dice pass to the next player. Regardless of who the shooter is, all bets on the table are in action with the shooter. Wait on a Roll of 4, 5, 6, 8, 9, 10 which becomes the "point"
Lose if 7 rolls before the "point"
That's really the game in a nutshell. Everything else is just frosting on the cake. If you want to bet against the shooter, you bet on the Don't Pass Line. On the don't pass, the first roll wins on 2 and 3, loses on 7 and 11, and pushes on a 12. There is a little box that says "bar 12" which means the don't pass line does not win on 12 - ever. All right, in Reno and Lake Tahoe, the table says "bar 2" because they like to be different so 3 and 12 win, 2 pushes. You now know enough to hit a craps table, get chips, and bet the pass line or don't pass line. Who knew? It's pretty easy. Want to make the only bet in the house where the casino has no edge? Read on! When you have a pass line bet, don't pass bet, or a come bet on a crap game and a point is established, the casino will allow you to make an "odds" bet. There are no boxes, signs or instructions for this bet. And the casino edge for this bet is none, zero, zip, zilch, nadda, nothing. That's cool. The stickman (you can figure out which dealer that is, right?) controls the dice and calls the roll totals. The inside dealers take bets, place them, and make payoffs. There may be another "suit" on the game, sitting on a small stool and watching the action. That's the boxman. He's the boss. He's there to correct the dealers, study the players, and be right. If you want a marker, he's the one to ask. On most crap games there is a set of five matching dice. They come in a "stick" and are opened when old dice get chipped, scratched, lost, or unlucky. As long as the shooter makes their point, they keep the dice. When they seven out (sorry, no such thing as crapping out, that's a Hollywood term), the next player clockwise from the boxman position is offered the dice - only choose two, please. The dealers will make sure you have a pass line or don't pass line bet before they offer the dice. This is also the time to make the fun proposition bets like any craps, the horn, seven, and eleven. The table limit will show a minimum for your pass bet, but a $5 table usually allows $1 prop bets like "eleven" that pay about 15 to 1 on a single roll. Once you have your pair of dice, don't take them off the table or hide them from the dealer. This makes them cranky and you will have to give them back for inspection. The stickman is responsible for always keeping their eyes on the dice. You can only shake the dice with one hand and you should shoot them so they bounce along the table before they hit the wall at the other end. A simple sidearm underhand lob is sufficient. The stickman will call the dice (the number you throw) and return them to you as long as you haven't sevened-out. If you bet the pass line and your first throw is 7 or 11, you will get paid even money. If you throw a 2, 3 or 12, the dealer will scoop your money away efficiently and greedily and wait for you to make another bet. If you roll a 4, 5, 6, 8, 9 or 10, that's your point. Once you make a point, you can take "odds" and get the best bet in the house. The dealer will help you with your odds bet, which goes between you and your pass line bet. Most casinos offer double odds - a chance to bet twice your pass line bet. It is easier to throw a 7 than any other number, so the casino pays you the true odds of making your point before 7 with an "odds" bet. When you bet the don't pass line, you are betting that the shooter will not make their point. On the come-out roll, you win on 2 and 3 and push on 12, but lose on 7 and 11. If a point of 4, 5 6, 8, 9 or 10 is established, you now have the edge, since it is easier to make a seven than any point. You will need to "lay" the odds if you want to back up your bet. The pass line bet has a casino edge of just 1.41 percent. Pass line "odds" bets have no house edge. The don't pass bet has a casino edge of just 1.36 percent. Again, there is no house edge if you lay the "odds" on a don't pass bet. 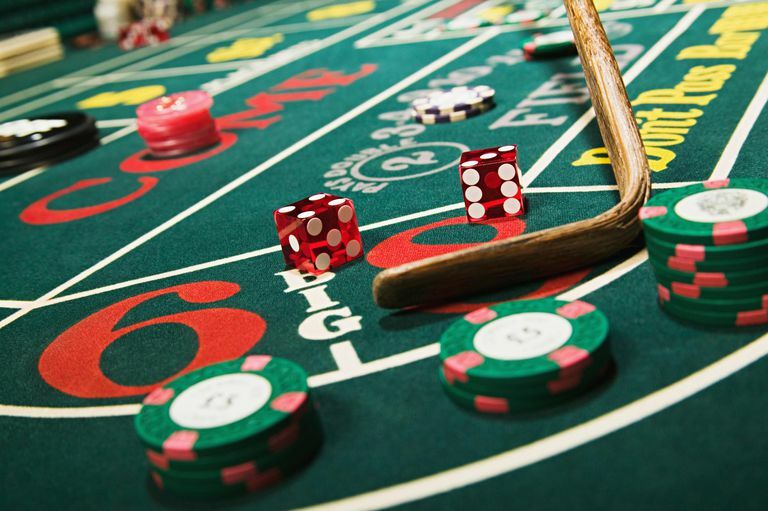 We've only scratched the surface of the bets you can make at a craps table. Don't be afraid to learn more about Multiple Roll Bets like Put Bets, Come Bets, Buy Bets, Hard Way Bets and the Big 6 and 8. Single Roll Bets like hopping hard ways and other horn bets are also fun, but the house has a larger edge over the player.